Van Bramer gets a win/win here, like Reynoso on Grand Street. 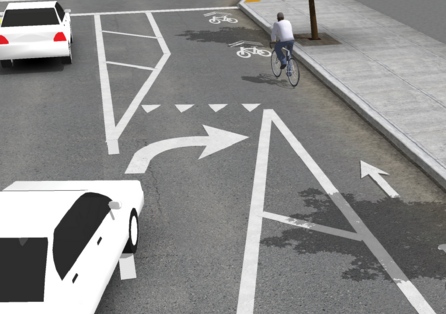 Support a protected bike lane that will never happen because it would require repurposing parking and you get the support of safety advocates on rhetoric and the support of NIMBYs on results. That crash was on Gun Hill Road, not the Bronx River Parkway. The driver sped off the BRP’s exit ramp, crossed the street, went over the sidewalk, and crashed into a wall on the far side. That sidewalk on the north side of the street has steady foot traffic, and is generally the safer side of the street for pedestrians because of fewer conflicts with drivers at the parkway ramps and the Webster Avenue intersection. I don’t think that’s fair. Few politicians are putting their necks out for people on bikes like JVB and Reynoso. (Carlos Menchaca, Brad Lander, Ydanis Rodriguez, and maybe one or two others, but that’s it.) There was a time not so long ago when politicians wouldn’t touch bike stuff with a ten-foot pole, even after a wake of tragic deaths. Now they’re asking for protected infrastructure, Citi Bike stations, and more, and some of them are even biking to work themselves. People at every level could always be doing more, but JVB deserves our praise and support here. I’m grateful for his efforts. To clarify a bit: I’m not saying they’re acting in bad faith, just that few bike lanes that require the removal of a parking or travel lane ever come to fruition outside of Manhattan except on ludicrously overbuilt streets like Kent and 111th. Hopefully a proposal will come for these CMs to support like Julissa Ferreras-Copeland on 111th or Carlos Menchaca with the recent miracle on 4th Avenue. I believe they’re “YIELD” symbols. No doubt others are lurking who know more than I do. Wow, that makes sense that they’re yield markings. I had not put 2 and 2 together there and I’ll bet that means that most drivers probably haven’t either. I’ve seen them proliferating, and I don’t know anyone who knows what they mean.